Absolutely the best dealer-oriented ad manager program on the market today. You will not get this kind of personal attention with other cookie-cutter services. You will not be disappointed with Auto Ad Manager. Auto Ad Manager is one of the easiest online programs we have found for our advertising needs. 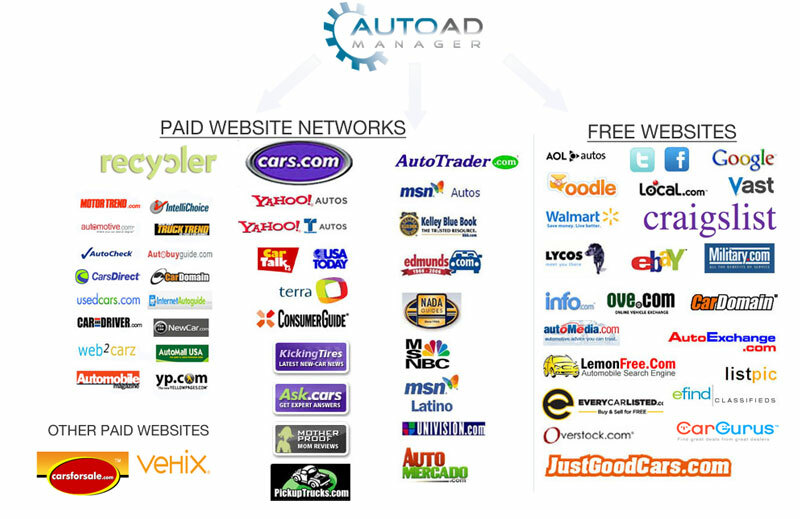 I have used Auto Ad Manager since 2009. They know how to get things done and communicate in a clear manner with those who may not have a technical understanding. I would recommend Auto Ad Manager to any car dealer. I've been using Auto Ad Manager for a number of years now, and am extremely happy with their service. I find the price to be fair, and it frees me up to do what I do best. A secure dealer responsive website is included with all packages with automatic Search Engine Optimization (SEO). That means a ton of visitors to your dealer website. 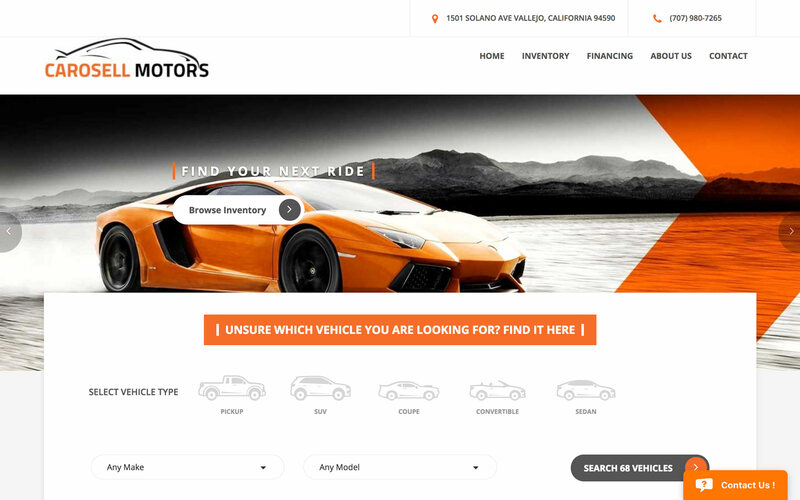 Easily add your vehicles to your inventory page. Your vehicles are then posted to our partner sites multiple times daily without any additional work from you. 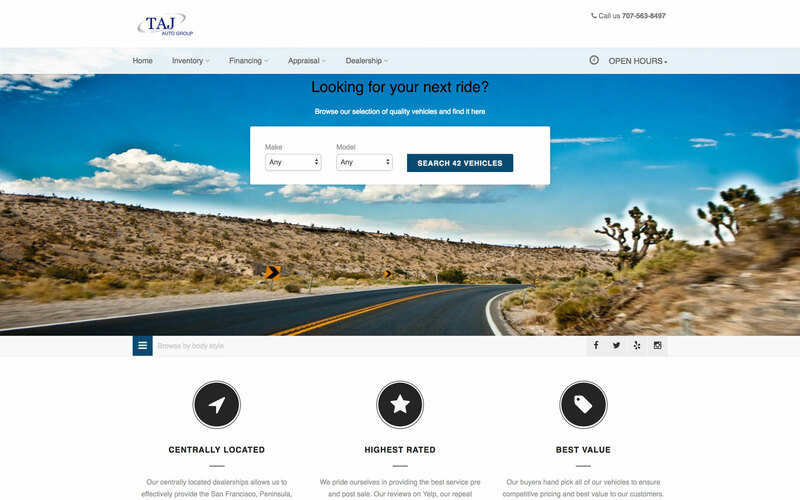 Your vehicles stand out thanks to our premium html template system with up to 36 images, custom header and footer images, map image, and company logo for posting on sites like eBay. And posting on Craigslist is easy, we even work with third parties that make it automatic! Our support is second to none. We are always available and offer personal service. When you need help or a change, consider it done! Auto Ad Manager can send your vehicles all over the internet for you. 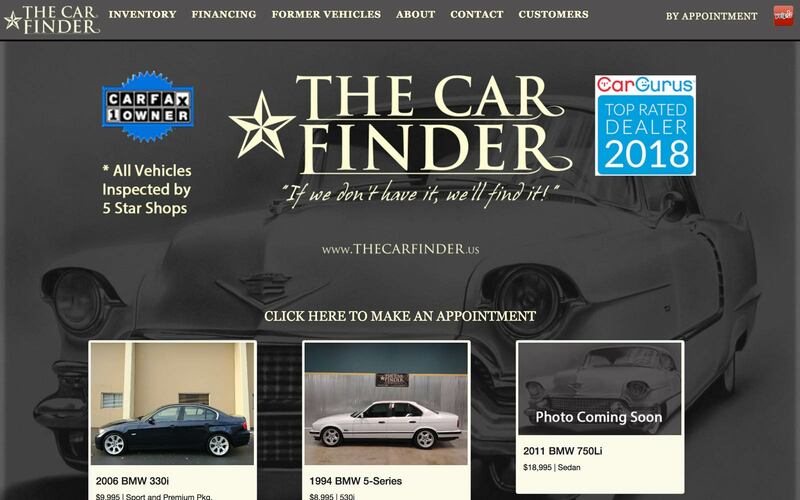 If there is a car site that customers are going to, your cars are there. Once you add a vehicle, Auto Ad Manager does the rest. That car is automatically uploaded to your advertising partners, free websites, your website, and customizable templates are created for your postings on Craigslist and Ebay. You can print any number of documents including window stickers, buyers guides front and back, and your full inventory list with thumbnails and prices for display at your dealership. Auto Ad Manager even lets you easily print your inventory for internal tracking purposes with aging information, photo amounts, and if you've added descriptions yet to a vehicle. Adding your inventory is easy thanks to our built in online Vin decoder, multiple photo uploader, image sorter, and drop down system. Simply add your Vin number, select from a list of options, and add all the photos from a folder all at once. We have made it fast and easy to get all your cars online. We can even accept bulk data uploads from popular programs like Karpower, Dealer Center, PRCo and Dealer Tracker to add your used cars even faster. You get a customized website that looks great on any device and a website specifically for mobile devices. This means pages load fast, contact forms are short, and directions sync with the users map application. And your website is more than just a template if you choose our base or premium package. What is Auto Ad Manager? 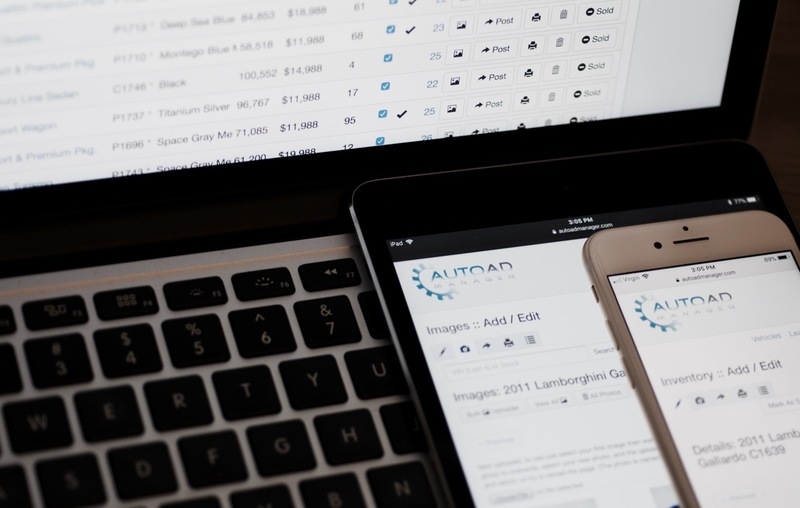 Auto Ad Manager is the best car dealership software to market and sell your vehicles online. 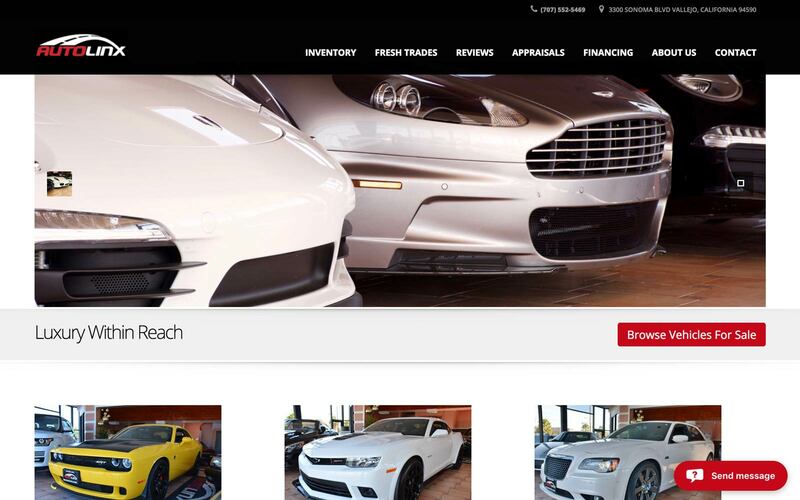 We offer a customized dealer website, a feed to third party used car websites, and an online inventory management system, all in one. 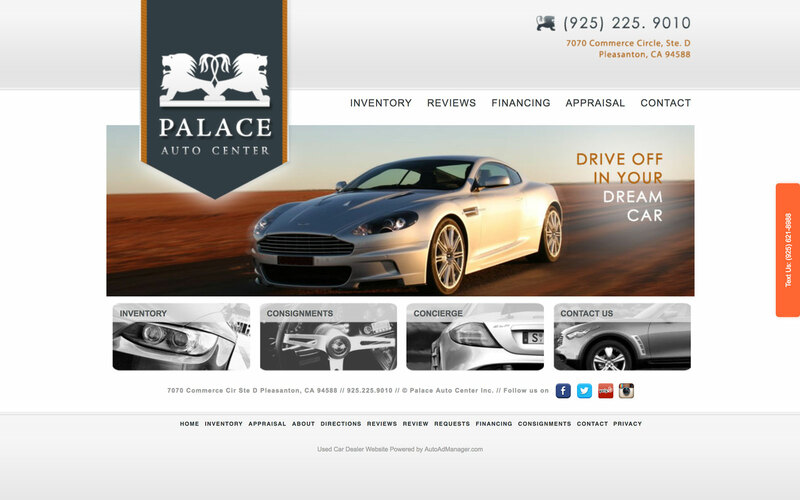 Based out of Pleasanton, California, we are poised near the heart of the technology industry and provide the latest in cutting edge website design and hosting, search engine optimization, html templates, and inventory feed technology for your used car dealership. No. If you are unhappy with our service you can cancel at anytime. Does Auto Ad Manager handle everything? Yes. Our service includes everything you need: A dealer website designed just for you, your inventory management account, automatic generation of html code that you can place on sites like Ebay and Craigslist easily, an inventory feed that updates all activity on your advertising partner websites like Autotrader.com, Cars.com, Vehix.com, Cars Direct, Search Engine Optimization (S.E.O), and more. What about managing my leads? 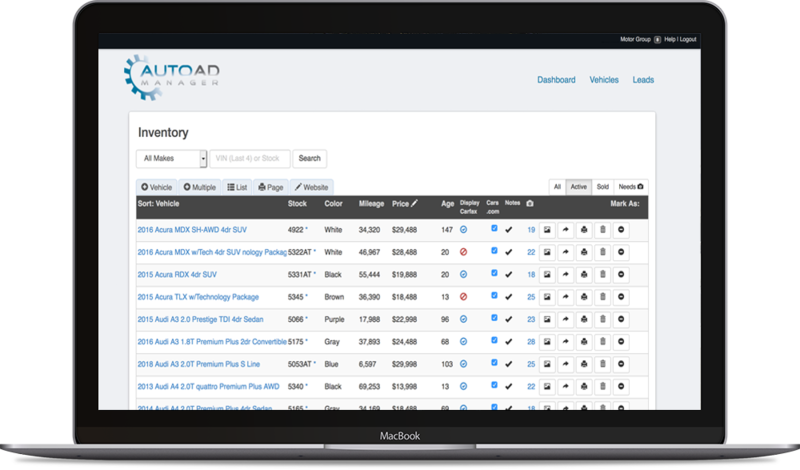 Auto Ad Manager has a built in lead management tool that allows you to track, update, delete, and add all of your leads. Thanks to integrated forms on your vehicle pages, it's easy for customers to get in contact with you and for you to quickly respond. Will my inventory and website be available at all times? We have partnered with a best of class hosting provider, content delivery partner, and security partner and utilize multiple private servers with frequent backups and security updates. Rest assured, your inventory and website will be available at all times possible. How do I use my Templates? Add your vehicle data to the system. Click on the post button and you are presented with multiple template options. The first 4 can be used on Craigslist and contain neatly formatted data as well as the business contact information. The last template can be used on sites like eBay that also allow images to be embedded in the ad. You simply copy and paste the template you want into the appropriate field on the site you want to advertise on and follow their steps. 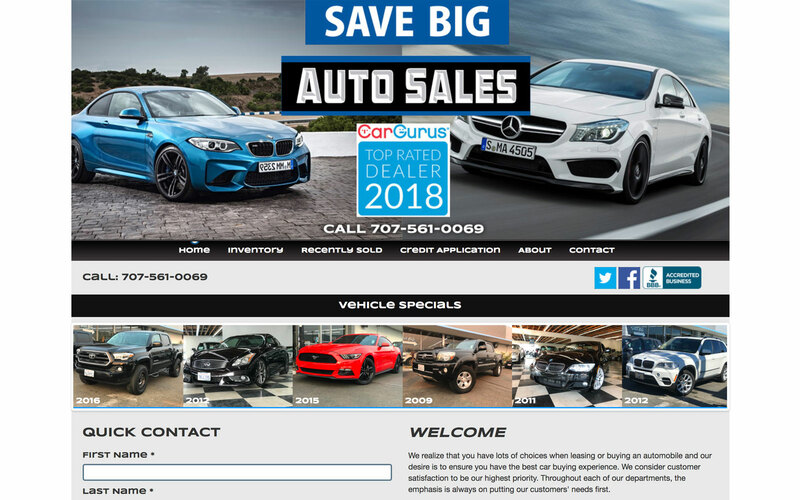 We will also send all of your inventory to multiple free websites including CarGurus.com, Oodle.com, Vast.com, Facebook, Twitter, Web2Carz, Google, AOL Autos, Lycos Classifieds, Walmart Classifieds, Overstock.com Autos, Kelly Blue Book, Carperks.com, Carfax.com, Automedia.com, and more! Aren't there other service providers like you? Sure, but none of them offer a best in class service with all of the features described above at our price. For one low price per month, you get top tier service without the top tier cost. Do you offer a photo service? Yes, but at this time we are not adding more dealerships who would like us to take their vehicle photos. If you would like to get on our wait list you can contact us here and we will contact you if a spot opens up. No contracts, No setup fees, Website Included.